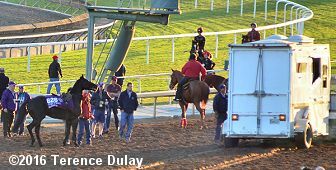 A loose horse runs down the stretch the wrong way Thursday morning. He ran back to the barns where he was captured. Today was another bright, clear, sunny day, at least once the sun was up. It was very chilly early, then warmed up to around 80 by the time works were finished. 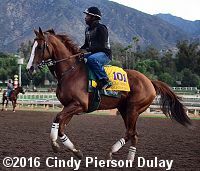 California Chrome was again out and back before sunrise today, and the last Europeans in quarantine were out today for the first time. We had two scratches today. First was Lord Nelson who was scratched from the Sprint after coming down with an infection. Second was Suedois who was vanned off after his turf gallop, which opened up a spot in the Turf Sprint for Green Mask to draw in off the also-eligible list. 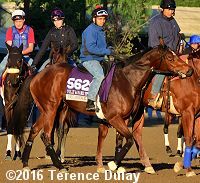 Here are photos for 39 of the horses on the track or in the paddock Thursday morning, mostly new from previous days. Click the small picture to see a larger version. 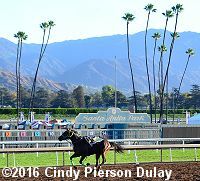 2016 Breeders' Cup Friday - There were four Breeders' Cup races on Friday at Santa Anita headlined by the Distaff (G1) where Beholder edged out favorite Songbird to win her 3rd Breeders' Cup race. Also on the card, New Money Honey won the Juvenile Fillies Turf (G1), Tamarkuz won the Dirt Mile (G1), and Oscar Performance won the Juvenile Turf (G1). Get the results, charts, and photos for all 8 stakes on the card. 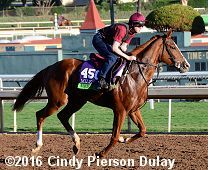 California Chrome galloped 1 5/8 miles under Dihigi Gladney. 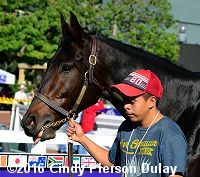 Gladney reported racing's richest runner was a handful today.�"I never really know exactly how far he'll gallop each morning, because sometimes I have a hard time pulling him up," he� said.� "He's really feeling strong in the mornings. 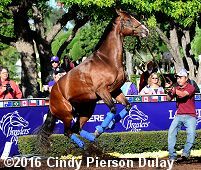 "� �Trainer Art Sherman playfully exclaimed, "It's Chrome time," as the son of Lucky Pulpit walked and bathed before his adoring fans. 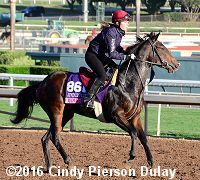 Beholder went to the track at 7 a.m. and galloped 1 1/2 mile over the main track in preparation for the Longines Breeders' Cup Distaff. "She's feeling great, really moving good across the track," said regular exercise rider Janeen Painter, who was in the irons. "She's been really focused, behaving herself well, so I think she is ready to give her best shot." Jockey Gary Stevens added, "On paper, this is the best Distaff I've ridden in, but I can go back to 1988 with a great filly and a great mare in Winning Colors and Personal Ensign, I've been in some good Distaffs before. I don't want to take anything away from years past, as I've said before, Beholder is the best horse I have ever ridden." 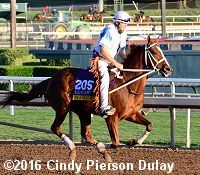 I'm a Chatterbox, ridden by her trainer Larry Jones, went to the track at 7:50 a.m. for an easy 1m gallop and then visited the paddock. Jones said, "She's always been an overachiever. She was overlooked at the sales, maybe because she was from the first crop of Munnings and her dam hadn't produced much. But, she always tries so hard and definitely matches up to them. But, this is tough race. There's going to be a Grade 1 winner finishing sixth in here." Alice Springs (Mile) walked for half a circuit of�the track before turning around and doing a gentle canter down the home stretch. 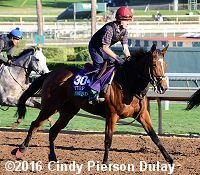 Trainer Aidan O'Brien said of her. "She's thrived since she got here, she'll like the fast ground and she has a lot of speed." Ambitious Brew (Turf Sprint) schooled in the paddock on Thursday. Calgary Cat (Turf Sprint) jogged down the hillside chute to test the dirt track crossover, and then galloped 1 mile around the infield course. 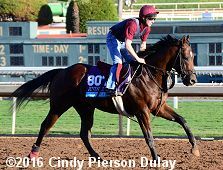 Classic Empire (Juvenile) left Barn 59 at 6:30 a.m. and proceeded to gallop 1m on the Santa Anita main track. Colorful Charades will break from the rail in the Juvenile Fillies, with Luis Saez aboard the 30-1 shot. Cougar Mountain (Mile) walked for half a circuit of the track before turning around and doing a gentle canter down the home stretch. 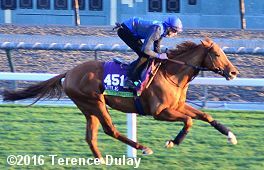 Dutch Connection (Mile) worked 4f on turf in 50.80 under jockey James Doyle. The pair trotted for half a circuit before picking up the pace and breezing down the home stretch. Finest City drew post 12 in the Filly and Mare Sprint, with Mike Smith in to ride the 12-1 shot. 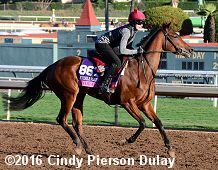 Found (Turf) also looked totally at home and was very calm and relaxed and her work rider reported the 4yo to be "absolutely bouncing." 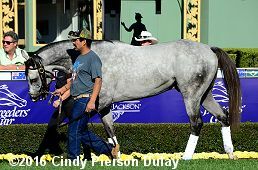 She walked for half a circuit of the track before turning around and doing a gentle canter down the home stretch. Green Mask (Turf Sprint) drew in as the second also-eligible, after Suedois was scratched due to injury sustained during this morning's gallop and first also-eligible Lady Shipman's connections opted to stay in the Senator Ken Maddy Stakes. 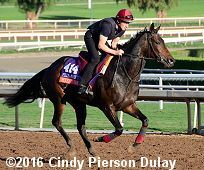 Haveyougoneaway (Filly and Mare Sprint) jogged Thursday morning,�two days out from the race that is part of her typical routine with trainer Tom Morley. 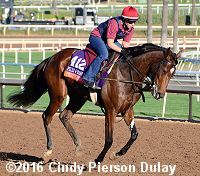 �"She's the 3-1 morning-line favorite and I think deservedly so," he said. "Every filly that she's run against in this field she has beaten. You don't want to sound cocky going into a Breeders' Cup race, but on paper she looks like the filly to beat. That's what you want when you come to the Breeders' Cup. You don't want to be 30-1.� You want to be the morning-line choice. I think she deserves to be. If she shows up with her performance in the Ballerina she deserves to be." Hit It a Bomb (Mile) walked for half a circuit of the track before turning around and doing a gentle canter down the home stretch. Hydrangea (Juvenile Fillies Turf) walked for half a circuit of the track before turning around and doing a gentle canter down the home stretch. Intelligence Cross (Juvenile Turf) walked for half a circuit of the track before turning around and doing a gentle canter down the home stretch. 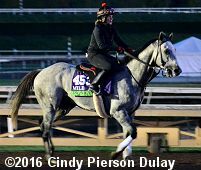 Ironicus galloped 1 1/4m Thursday while preparing for Saturday's Mile at Santa Anita. "He likes it. 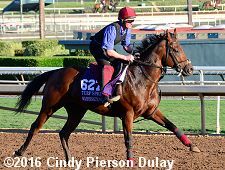 He likes to train and he loves to run," trainer Shug McGaughey said. "He's got a good pedigree. He's just one of those horses. He's a good horse. He's got a strong kick. When he kicks, he kicks hard. He's gotten beat a couple times because he didn't get the trip, which is part of grass racing. 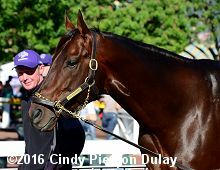 Last time he didn't get the trip and in the Manhattan, if we got the trip Flintshire got, I think we probably would have won. The same thing will happen here � he'll kick, it's just a matter of what kind of trip he gets." Jamyson 'n Ginger worked 3f in 37.60 in preparation for the Juvenile Fillies. J.S. Choice drew post 7 in the Juvenile Turf, with Kent Desormeaux booked to ride the 20-1 shot. Kitten's Cat is the first also-eligible in Friday's Juvenile Turf, and is cross entered in Saturday's Juvenile Turf Sprint. Lancaster Bomber (Juvenile Turf) walked for half a circuit of the track before turning around and doing a gentle canter down the home stretch. 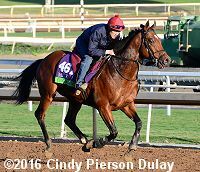 Limato (Mile) worked 3f on turf in 38.40 under jockey Harry Bentley. Trainer Henry Candy said, "Limato is the best horse I have trained, and he is very happy which makes me happy too. I put him through the stalls this morning, as I thought that was the right thing to do with him this morning, and Harry said he was as quick out of the gate as he has ever been. He's a handful to get a saddle on, but after that he's very professional. I'm looking forward to Saturday." Lookin at Lee (Juvenile) was the first horse we saw lit by sunshine this morning. 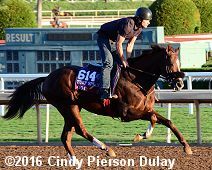 Om galloped 1m on the main track at 7:45 with regular exercise rider Greg Hendricks.�Jockey Gary Stevens believes Om's inexperience down the hillside turf course (for the Turf Sprint) will not be a problem. "Even though Om has never run the down hillside turf course his running style suits this layout extremely well from my past experiences," Stevens said. "I love his post position and outside draw. 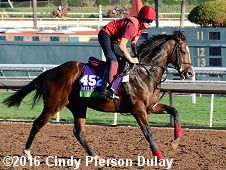 There are two horses with similar styles on either side of him in Ambitious Brew and Holy Lute, but I always love drawing towards the outside coming down the hill, I have won a lot of races from up there." 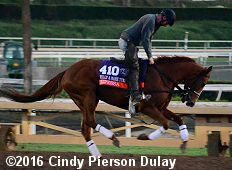 Paulassilverlining (Filly and Mare Sprint) jogged one mile after working 4f in 51 seconds Tuesday. "I'm happy with the post positions we got," Michelle Nevin said. 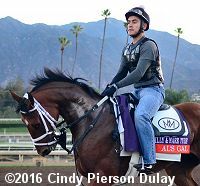 "Both of my fillies (Paulassilverlining and By the Moon) are tactical. I like being a little outside so they can just drop over and settle. It's going to be a very tactical race for 90 percent of the fillies in there. I just need two really good rides." Pretty Perfect (Filly and Mare Turf) walked for half a circuit of the track before turning around and doing a gentle canter down the home stretch. Roly Poly (Juvenile Fillies Turf) walked for half a circuit of the track before turning around and doing a gentle canter down the home stretch. 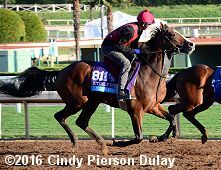 Runhappy, 3-1 second choice on the morning line for Friday's Las Vegas Breeders' Cup Dirt Mile, was on the track at Santa Anita at 5 a.m. Thursday to jog twice around under exercise rider Marcus O'Donnell. 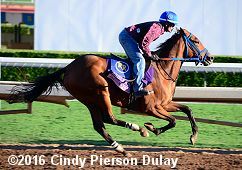 Trainer Laura Wohlers, who will be sending out her first Breeders' Cup starter, said Runhappy likely would go to the track Friday morning during the 4:45-6:45 training window. "I usually jog my horses on the day of a race," Wohlers said. 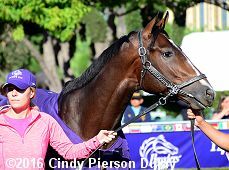 Seventh Heaven who lines up in Saturday's Filly & Mare Turf also was reported to be in "very fine form." She walked for half a circuit of the track before turning around and doing a gentle canter down the home stretch. Spelling Again (Filly and Mare Sprint) galloped 1 mile and then schooled in the paddock. Suedois (Turf Sprint) galloped in company with stablemate Mondialiste (Turf) but was pulled up at the 3/16 by exercise rider Colin Bolger and walked the rest of the stretch. Suedois was taken off the track in a horse ambulance, and was subsequently diagnosed as having suffered a stress fracture of the off fore hoof. Trainer David O'Meara confirmed the horse was scratched from Saturday's race. 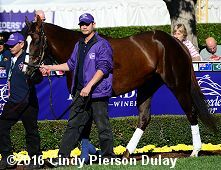 "Unfortunately, he has a stress fracture, but he will be OK in the long run, and will race again next year," he said. Sweet Loretta galloped 1m for Saturday's Juvenile Fillies. "She's been a consummate professional so far to win her three starts and step up in class and distance each time," trainer Todd Pletcher said. 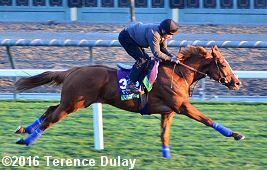 Ulysses (Turf) worked 3f over the firm turf course in 35.20 under exercise rider Kevin Bradshaw. Washington DC (Turf Sprint) walked for half a circuit of the track before turning around and doing a gentle canter down the home stretch. 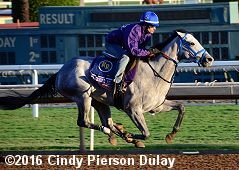 Zipessa (Filly and Mare Turf) left Barn 36 around 7:30 a.m. to gallop an easy 1 1/2m. "She just galloped easily, just the same as yesterday," Mike Stidham said. "She's doing well, she shipped well and though we might have to have rocket fuel to beat them, we are confident she will run well. Obviously it's to our advantage to have run well already on the course. The fact is she ran a big race over that grass and handled the distance. That was a concern going into the Rodeo Drive and we were happy with how she ran afterward. Now it's just a matter of the kind of trip and how good she is against this group. 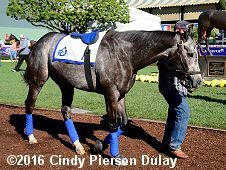 We'll break and see how it's setting up, but she does have speed and we'd love to be in the controlling spot early if Catch a Glimpse isn't there already." This unknown paddock schooler (only had Sadler on his halter) had a bit of a fit and drug his groom off on the path back to the barns.